Super-indelible, never come off till your dead or maybe even later markers! So I love children’s books. There are always great illustrations and stories. The characters are meaningful and there are often times themes that relate to your life. I got to read an awesome book this week that reminded me about my US-2 experience thus far. It’s called Purple, Green and Yellow. This Robert Munsch book is about a little girl who loves to color so she begs her mom for different kinds of markers. Well she gets bored with the last set which just so happen to be super-indelible, never come off till your dead or maybe even later markers. When she gets bored she decides to color on herself and of course this can not be undone. And I’ve found that my experience has been this way thus far. I thought I’d share with you one of the events from this past weekend that is a super-indelible, never come off till your dead or maybe even later marker on my life. This past week was Read Across America week, aka the week before Dr. Seuss’ birthday. In my previous life as a kindergarten teacher, this was a really big week. We had volunteers come and read each day and dress up days, and a DEAR time(drop everything and read!). I didn’t think that I would be celebrating this event with my current placement site but little did I know…. It all started with the conversation about needing to replace old, outdated books from our libraries with new, pretty books that kids will love to grab off of the shelves. In our staff meeting in the question was asked is there a good time to push for book donations? I said well Dr. Seuss’ birthday is a big day in schools, a great event that already existed. 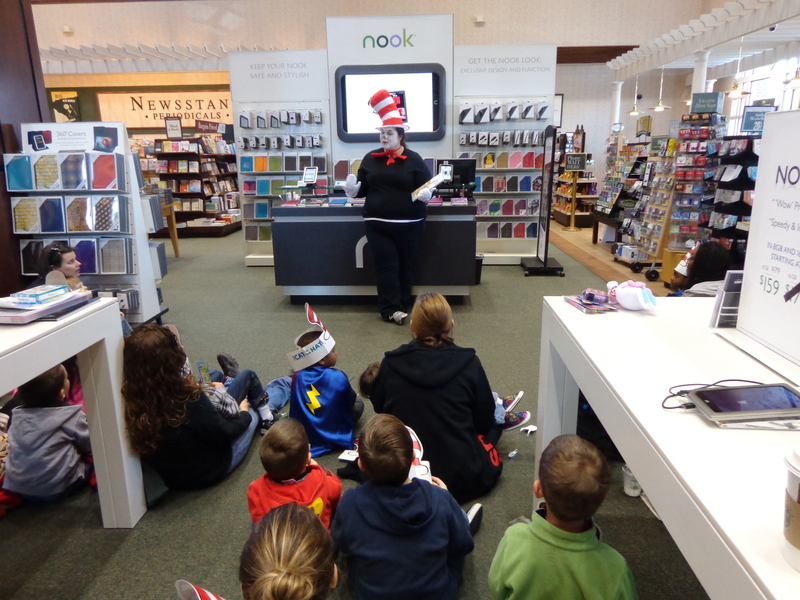 This began what became, like Gru from Despicable Me would say, “kinda a big deal!” We ended up having guest readers come to a few of our sites to read Dr. Seuss books… myself included… and ended on Saturday at Barnes and Noble in Dallas and West Plano with a book drive. 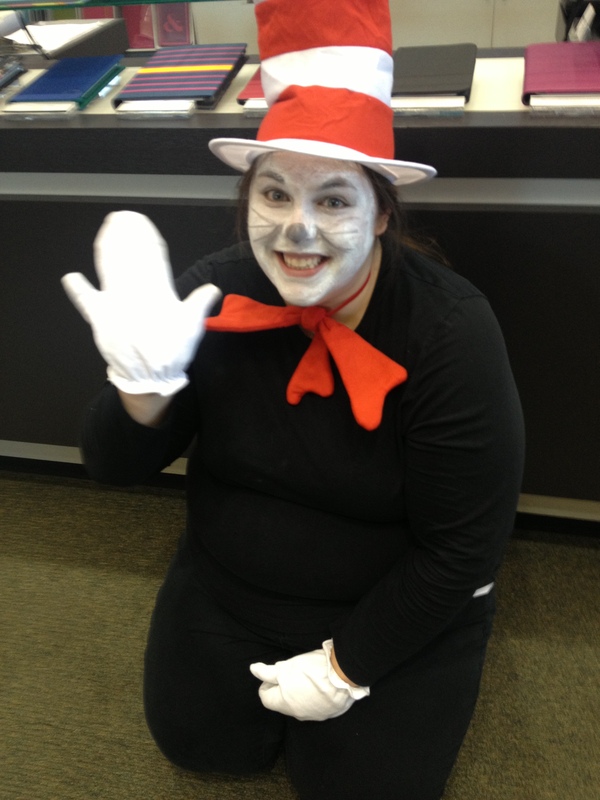 Oh, yeah and I got to dress up as the Cat in the Hat, complete with face paint and 3 fingered gloves, and read to the kids for story time! I love being able to share my love for reading with lots of people! I got to hang out and color with some really cool little kids, read one of my favorite books, and share what Project Transformation does in the Dallas community. I got to talk about the program with several people and they were excited about what we do and were interested in helping out. It was great to see people get as excited as I am about what we are doing. It’s funny how you can’t help but fall in love with the program and when you fall in love with something you want to share it with everyone! I’m not sure how much money we made overall but I think it was a very successful day. Reading to kids this week reminded me how much I love acting silly and reading aloud. I know I’ve said this before, but this opportunity to work with Project Transformation has opened my eyes to so many things. Before coming here, I didn’t know really where I was headed and was really nervous about the future. There were some super-indelible, never come off till your dead or maybe even later marks that had left me wondering where I was headed. Now, don’t ask me where I’m going after this because I sure as heck don’t know. But for the first time in a long time, I see possibilities, lots of possibilities, and that feels really good. This is definitely leaving some super-indelible, never come off until your dead or maybe even later marks on me. I’m catching up on my blog reading and wanted to say a few things. I too love childrens books and reading with kids. I love the book Purple, Green, and Yellow, and who doesn’t love Dr. Seuss?! I am so excited for you and how well you seem to be doing at your placement site. It is a great fit and they are lucky to have such a passionate person working with them!